A detective at the commission, who did not want his name in print, said, “You will recall that we have been looking for Dikko for quite some time. He turned himself in around 10am today (Thursday) and he is being quizzed over two key allegations bordering on criminal conspiracy, diversion of public funds, theft, abuse of office and living above legitimate means. “There is also a further allegation that he diverted over N40bn from the Customs’ coffers. The funds were drawn from the proceeds of the seven per cent cost of collection and one per cent comprehensive import supervision scheme. 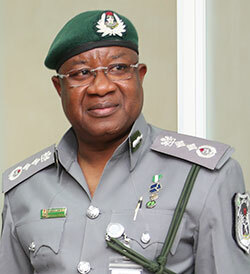 The EFCC operatives had on January 8, raided the residence of the ex-Customs boss. Dikko is also being investigated over a N3bn vote spent by the NCS a few days to the inauguration of President Muhammadu Buhari in 2015. The said cash, which was allegedly spent on the directive of the Presidency, was regarded as “unjustifiably used” by the Customs’ management. There are also issues bordering on the alleged diversion of Customs revenues to fund the campaign of the Peoples Democratic Party and ex-President Goodluck Jonathan in 2011 and 2015. After oil and taxes, the NCS is the third highest revenue generating agency of the Federal Government.